Hydra Sailing guide - Yacht charters and sailing holidays in Hydra, Athens, Greece. The Hydra gulf lies between the saronic gulf and the argolic gulf and is a one of the most popular yacht charter areas in Greece. The island of Hydra - Ύδρα (ancient Hydraea) itself is a bare monolithic ridge of limestone, 12 km long by 5 km wide, lying off the south-east coast of the Argolid. Arid and infertile, it lives mainly from the tourist trade and the sale of craft products (jewellery, pottery, embroidery, hand-woven cloth, leather-work). A tempting local speciality is the almond cake called amygdalote. 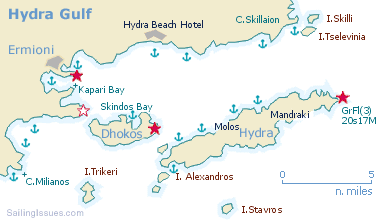 North-west of Hydra is the little grazing island of Dokos (the ancient Aperopia), with the village of the same name in a sheltered bay on the north coast. The mainland (in fact the Peloponnese peninsula) features many interesting anchorages and the handsome village of Ermioni. Hydra was already settled in Mycenaean times, but was a place of no importance until the 18th c. In the 15th c. and again in 1770, after the revolt in the Morea, Albanian refugees made their home on the island, and as a result of their efforts - in trade and shipping, but also in piracy - it became prosperous and wealthy. During the War of Greek Independence the Hydriots converted their trading vessels into warships and met a large proportion of the cost of the war. The island has now reverted to its original unimportance. The little town of Hydra (pop. 2500), climbs picturesquely up the slopes of the hills round its sheltered harbour on the north coast of the island. It is now a favourite resort, particularly painters, and intellectuals, who give the town its particular aspect and atmosphere. On the quay is the old Conventual Church of the Panyia (17th c.), with a beautiful cloister. On the other side of the harbour are the imposing mansions of early 19th c. ship owners and merchants, including the houses of Admiral Lakovos Tombazis (now occupied by an outstation of the Athens Academy of Art) and Dimitrios Voulgaris. One such mansion houses a training school for the merchant navy. The plain white and sometimes colour-washed houses of the town on the slopes above the harbour are rather Cycladic in type. Above the town to the west are the ruins of a medieval castle, and lower down are fortifications built during the War of Independence. 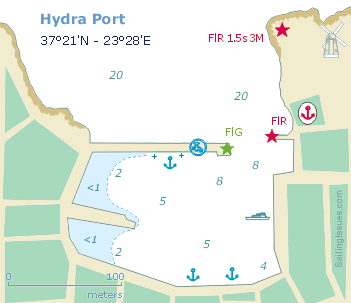 The Hydra harbour can get quite crowded in the summer months, ten ferries a day plus the odd cruise ship anchored off make it a very tight squeeze altogether. Moreover, anchors are often fouled by other anchor chains and holding is in some places very poor. The best tavernas can be found further up in town. 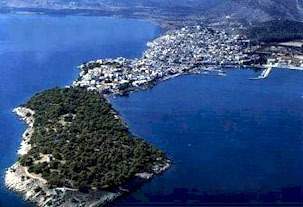 The friendly village of Ermioni (Hermioni) is located at the stem of a wooded headland. Despite its proximity to Athens the place is relatively tranquil and unspoiled from tourists. 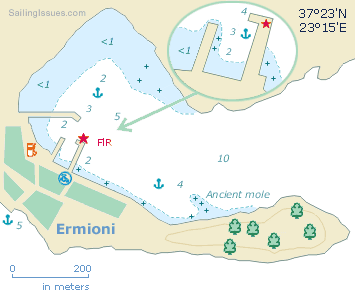 In earlier times Ermioni was of some importance as shown by the ancient mole and walls near the end of the headland. You can either anchor near this ancient mole or go stern-to or bows-to behind the outer mole. Go to the south side of the headland for more peace and quiet and wonderful vistas across the Hydra Gulf. Ermioni looking along the headland (cape Kastri) to the east.